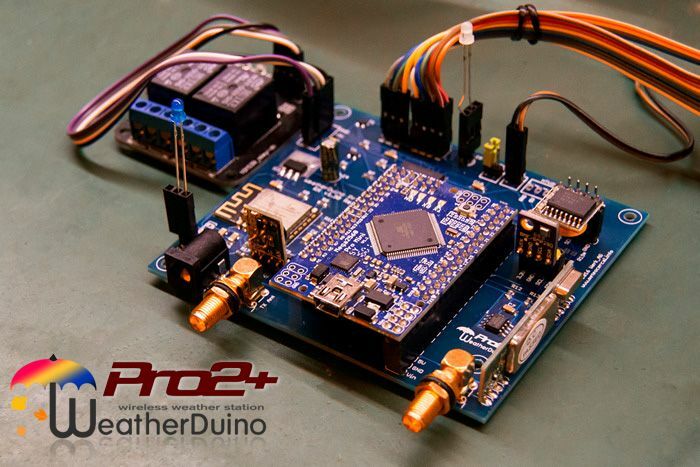 The WeatherDuino Pro2 PLUS is the newest base unit - receiver for the WeatherDuino Pro2 weather station system. Compared to the previous Pro2 base units - receivers (which will continue to be available and supported for long time), it greatly expandes its power and brings new interesting features, some of them as we will see, with the future in mind. The microcontroller was changed to a ATmega 2560, with 256K of RAM and 8K of SRAM. The bigger memory its important to accommodate the larger size of the new software and leave enough space to future enhancements. The bigger memory is also important to advanced users: The new Pro2 PLUS board have 2 GPIO ports plus 1 GPO port (up to 50mA) which can be used to control external devices, as heaters, watering systems, or whatever the user will want, by just writing simple routines, which can use any of the internal variables containing weather data. The default display was also changed from the 20x4 LCD to a 2.8" - 320x240 colour TFT display with touch control. The screen layout was designed to have the same look and feel, of the already existing Wireless Display units, whose software has also been upgraded to support the new functionalities provided by the Pro2 PLUS. One more time backward compatibility with existing hardware, was taken seriously. All existing transmitter units will work with the Pro2 PLUS, even without any software upgrade. The full seven extra sensors supported by the DAVIS system, can now be seen at once in the screen. By just touching on the right or left side of the display you can switch to other screens, as the one that shows all the info from up to four Soil Temperature / Moisture sensors, and Leaf / Wetness sensors. But there is more: Double press a push button and instantly you will see a graph of the last 12 hours, for Atmospheric Pressure, Temperature, Humidity, Rain, Wind Speed and Gust. A screen saver is also included... after a user defined timeout, you can just blank the screen, or choose to have a nice clock displayed with big digits, showing current date and time. By talk about date and time. The Pro2 PLUS will automatically adjust the clock, whenever there is changes in the Summer Time, no matter the country you live. Also, if you enable its WiFi connection, the system clock will be automatically synchronised with a user defined Time Server, using the NTP protocol. The new WiFi feature, is not just to synchronize the time. For everyone that would like to have a record of their meteorological data, but don't need or want to have a PC or a Raspberry running 24 hours a day, the Pro2 PLUS can work as an autonomous unit, and upload your weather station data to WUnderground, by just using your home WiFi network. real time data, and state of your weather station. A final line about functionalities. 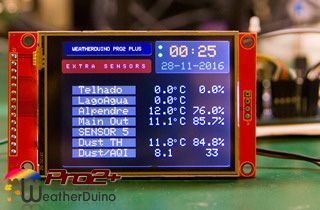 There are rumours, that a team of developers is working on a Air Quality Monitor for the WeatherDuino Pro2 PLUS system. 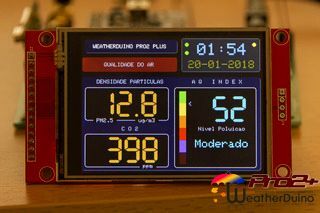 If those rumours will become true, the WeatherDuino Pro2 PLUS will risk to become the first weather station having integrated support for Air Quality (2.5ppm) measurement. The WeatherDuino Pro2 PLUS is one of the easier boards to assemble ever released. The PCB includes all the SMD parts already welded, and the final user only have to weld a variety of single and double row 2.54mm headers, to connect the display, the local sensors (ATM, Temperature / Humidity) and the microcontroller board. Let's start by the microcontroller. The Pro2 PLUS uses a Meduino Mega2560 Pro-mini board, which includes an ATMEL Mega 2560 microcontroller and a robust USB port. This board can be directly welded on the main board, or installed in a socket. The board is available in two versions: with double pin headers, or double female socket. The best place to find the Meduino Mega2560 Pro-mini, is on eBay, search by Meduino. A special note to Australian users: One of the sellers can ship it from Australia, allowing a quick delivery at a slightly lower price. Regarding the sensors for reading ATM and inside Temperature / Humidity, there is also novelties. The Pro2 PLUS includes support for the new BOSCH integrated environmental sensor BME280, which combines in just one unit, individual high linearity, high accuracy sensors for pressure, humidity and temperature. However, Pro2 PLUS continues to allow the use of separate sensors for Atmospheric Pressure and home Temperature / Humidity. - ATM: BME280, BMP280, BMP180, BMP085. A very, very important part on all WeatherDuino Pro2 or WeatherDuino Pro2 PLUS units, is the radio modules. The Pro2 PLUS uses the same well tested radio modules, also used on the Pro2 system. Do your best to get exactly the same modules pictured on the parts list, take special care with the receiver module, ensure it is a RXB6 with a 433 mark on the crystal, other very similar modules may work, but most of the times they have a poor performance. 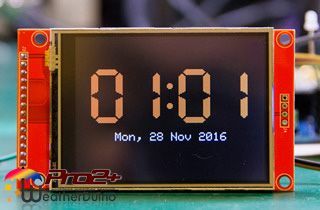 While the Pro2 PLUS keeps the possibility to use an 20x4 LCD display, another of it's interesting novelties is the support for a 2.8" colour TFT display with touch panel. The touch panel is required, as most of the changes between the several screens with data, are done just by touching in the right or left side of the display. The screens with the graphics are accessed by a double click on the push button, that also acts as a switch to turn On of Off the screen backlight, with a single click. 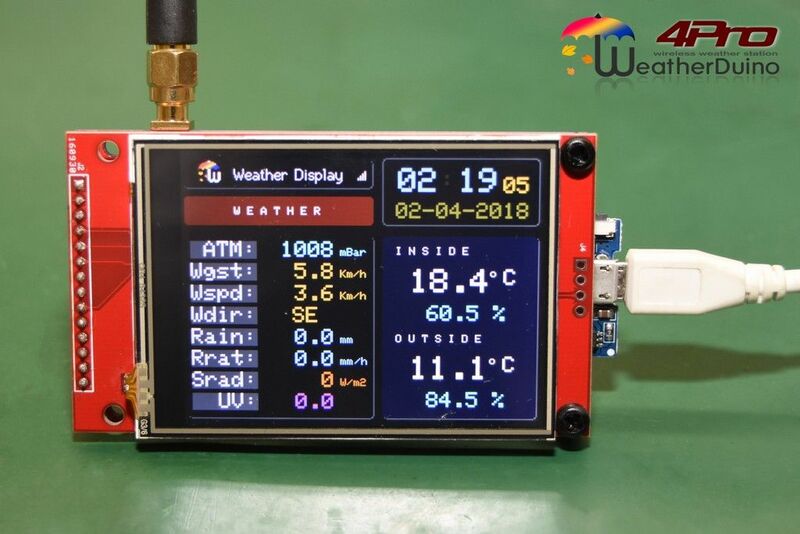 The ILI9341 TFT display used on the Pro2 PLUS base unit, is a well know product, already used in other WeatherDuino units, as is the case of the Wireless Display units. 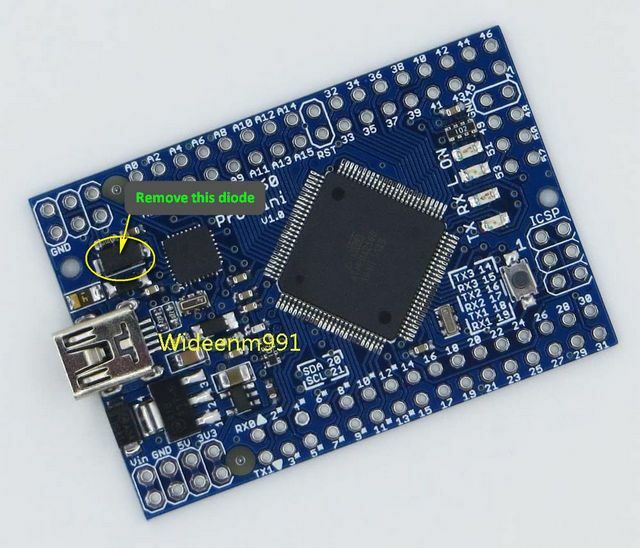 As said before, complete the assembling of the the Pro2 PLUS board is very easy, mainly because all SMD parts are already assembled, however, as happen when you deal with an electronic circuit, you should have some cares to finalize the assembling. The board includes some static sensitive IC's, so take the usual cares when dealing with this kind of devices. If you need Google for more info about this matter. No matter what you have read somewhere in any post, resist to the temptation to apply power to an unfinished board, you gain nothing and risk to damage it. An unfinished board, is a board that doesn't have all the required parts installed, and all means exactly all (RTC module, ATM and / or Temp / Hum sensors, radios RX and TX, TFT display and the controller board). Now, if you already have all the parts installed, its time to apply power to the board, for programming it. There is a very important procedure, that should always be done on the Meduino Mini Mega board before installing it onto the WeatherDuino Pro2 PLUS receiver board. Always remove the diode illustrated on the picture bellow. A failure of doing this procedure main lead to permanent damages in the WeatherDuino Pro2 PLUS receiver, in the event that the main power supply fail, and it remains powered by USB. Removing this diode, ensures that the Receiver only gets power when powered by through the external power supply. Before connecting any power supply to the Pro2 PLUS, always measure its output voltage with a voltmeter. Make sure that it is in the range of 7.5V to 9V. Powering the system with a voltage greater than 9V will make that the voltage regulators produce excessive heat. Under normal work conditions the 3.3V voltage regulator runs just slightly warm, and moderately hot when the TFT backlight is on, but never very hot. 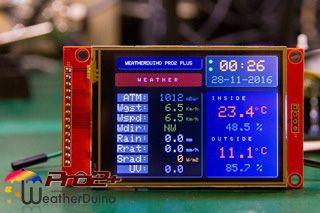 The WeatherDuino Pro2 PLUS was been released on December 2016. Since then, always using the same hardware platform, the system was had many developments, increasing its usability and functionality. Five software versions have been released during the last year, some of them had bring big improvements, like the possibility to choose the language of the user interface. English, Czech, Dutch, German, French, Portuguese, and Spanish languages are already available, more will come soon. Among all enhancements, there is a special one: The WeatherDuino Air Quality Monitor. Announced in 2016 as a rumour, it comes to reality in the second half of 2017, turning the WeatherDuino Pro2 PLUS, in one of the first weather stations, having Air Quality data, integrated. Now, the big news: Since January 2018, any user of a WeatherDuino Pro2 PLUS equiped with an Air Quality Monitor, can upload and see their Air Quality data on the Weather Underground pages. There is no need of any special software, WeatherDuino Pro2 PLUS does it all for you, sending the data through the WiFi connection. Edited 21-07-2018: Due to recent changes on WU, currently AQI data isn't shown. 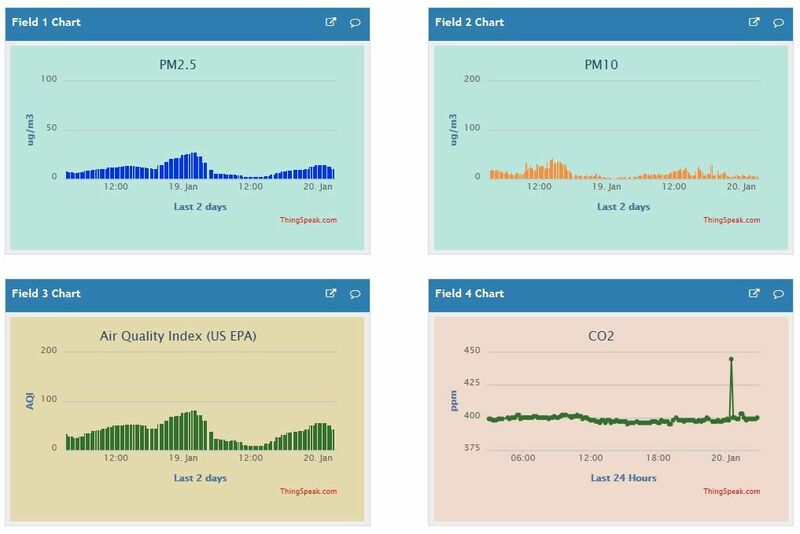 The WeatherDuino Pro2 Plus can also upload the Air Quality data to services like ThingSpeak, allowing a complete personalization of the presented data. Many thanks to all. A special thanks to, those that have helped (spending their time and money on the sensors) in the very long test period of the Air Quality Monitor, those that contributed with the translations, and also to those that don't hesitate to report a bug. One of the remarkable features of the WeatherDuino Pro2 PLUS system is its ability to retransmit all the weather data to several remote units, placed anywhere in the the house. Those remote devices are called Wireless Display units. Up to now, the transmission of these data to the Wireless Display is done by using a small RF transmitter. This technique works well but imposes a small penalization in the receiver capability to receive data from the outside transmitter units, which should be its main goal. However, things have changed now! Since the release of the new Wireless Display units with WiFi capabilities, a new world of possibilities is open. If you want to read more info about these units, click here. 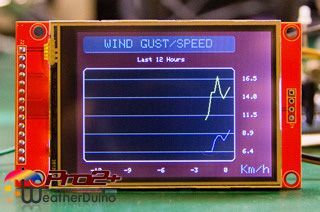 From WeatherDuino Pro2 PLUS v7 software onward, its now possible to retransmit all the weather data to the WiFi Wireless Display units using the local network. Data transmission not only is considerably faster, as using it instead of the old RF method, brings an increase in RF Efficiency of around 10% to 15%, in some cases the increase in RF Efficiency can be even bigger. To use this new possibility, there is no need to do any change on the hardware of the WeatherDuino Pro2 PLUS receivers no matter what PCB version it uses. For those are now assembling new systems, or are planing to assembling one soon, this also mean they can choose to not install the small RF transmitter on the Pro2 PLUS receiver. With WeatherDuino Pro2 PLUS v7 software, you can extend even more the utility of yours WiiFi Wireless Display can units, using each one as an additional Extra Sensor. So WiFi Wireless Display units also send data back to the Pro2 PLUS receiver. Current time: 26-04-2019, 02:38 Powered By MyBB, © 2002-2019 MyBB Group.